Use your business cards and get LinkedIn . 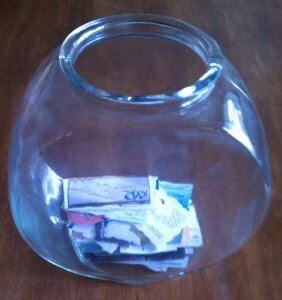 . . A fish bowl, full of business cards, is sitting in my room. The business cards are wading idly, yet they are working for me every day. My sister and I attended the 2011 Business Growth Expo in Tempe, Arizona at the beginning of the month. We met a lot of amazing people. The expo was our first attempt at renting a booth to interact with local business owners and we had a fantastic time. At the show, everyone handed everyone else their business cards. Business cards are essential when establishing business relationships and have been used effectively to garner business for millions of people around the world. Just as business cards are essential in interacting with new people to promote and grow your business in person, LinkedIn has become the online equivalent of a business card . . . only more effective. Upon returning from the Expo, my sister and I went through our business cards and uploaded all of our contacts to our Gmail accounts and then sent LinkedIn requests to all the people we received business cards from at the show. Now, when I go to my LinkedIn profile, it is full of the friendly faces I remember meeting at the beginning of the month. Not only that, but I now get to interact with those individuals on a regular basis. It’s also easy to find more information about their business and their job experience, which is very helpful when you have questions about a product or service or even business advice. I remember receiving business cards in the past. I had every intention of using them when my need for their service arose, but when the time came to make a purchase, I simply forgot my friend who had given me their business card months ago. I missed out on a beneficial relationship with someone I had the opportunity to meet. If you want your business cards to work for you, be sure to add every business card contact you get on LinkedIn, stay connected and develop meaningful relationships. Use your business cards and get LinkedIn. Posted in 2011 AZ Business Growth Expo, LinkedIn, Social Media Tips and tagged 2011 Business Growth Expo, Arizona, Business Cards, business owner, Fish Bowl, Gmail, LinkedIn, Local Business Owners, Tempe. Hi Zeb, Good job on this article and I had not thought of LinkIn’ing all of them. That’s a good idea. Haha. I was trying to be clever. Thanks for commenting on our articles! Great way to keep the benefits of a conference going and transitioning the brief meetings into the foundation of a relationship. Great idea Zeb! Thanks Michael! It’s worked well so far. Good! Hopefully you’ll be able to use this to increase your business. Zeb, I try to follow the exact same strategy but here is the dilemma I always face and maybe you can help me find a solution. I can never find people on Linkedin with their business emails! They probably created their accounts with their personal emails so when I search by the business email…can’t find it! If I try to search by first and last names, I’m faced with pages of people with the same so it get harder. You can request to add people by their email address. An email will be sent to that address and they may add you as a result. Not everyone will add you, but many will. Now you’ve got a use for all those cards.